Edward Alfred Angelo Goodall (1819-1908), the long-lived son of Edward Goodall, Turner’s engraver and brother to three other artists (Frederick, Walter and Eliza), made his name as a landscape and Orientalist painter. Clarkson Stanfield recognised Goodall’s precocious talent whilst still a teenager and Goodall first made his name as relief artist on a joint British/Prussian Schomburgk expedition to map and to collect natural history material in (British) Guiana in 1841. Goodall freely portrayed the landscape, peoples, plants and animals of the area, illustrations now to be found in the British Library. Upon his return Goodall continued to exhibit, at the Royal Academy, the British Institution, the Society of British Artists and, most notably, at the Royal Society of Painters in Watercolours, of which he was elected a member in 1864. 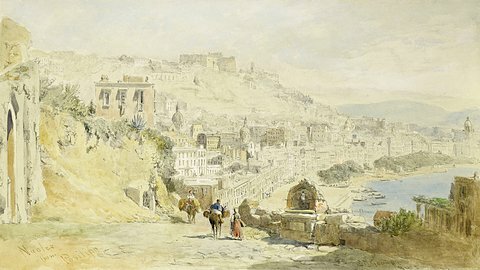 Goodall led a peripatetic existence with frequent visits to France, Spain, Portugal and Italy with travels further afield to the Crimea (where he was engaged as a war artist by the Illustrated London News), Morocco and Egypt. He continued up to his death to exhibit in London.